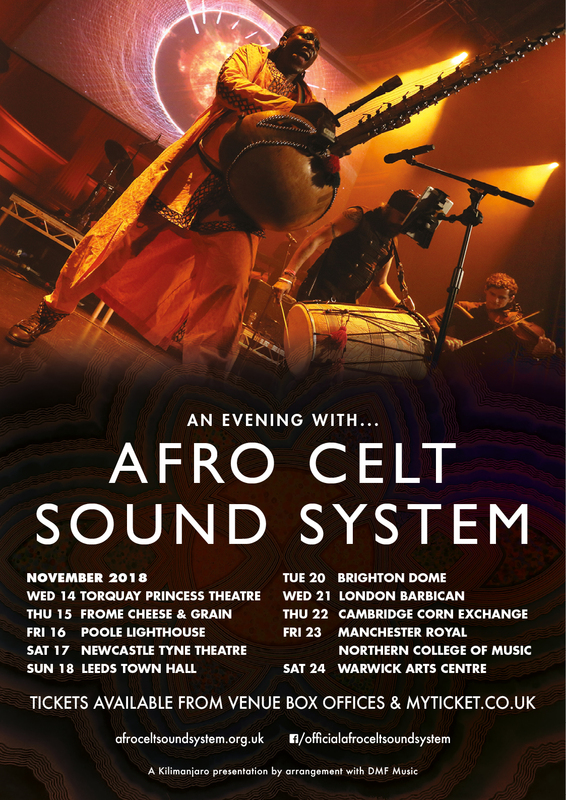 Driving afro house, drum and bass beats, bold West African brass and exuberant electronics herald the welcome return of the Afro Celt Sound System who are soaring high with their brand new studio album Flight. 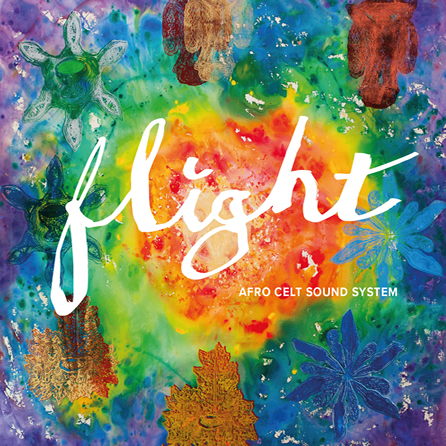 Featuring a dazzling cast of stellar musicians from around the globe, Flight explores the themes of migration – both human and avian – and introduces moving devotional songs alongside their trademark fusion of international folk music, blistering beats and boundless energy. 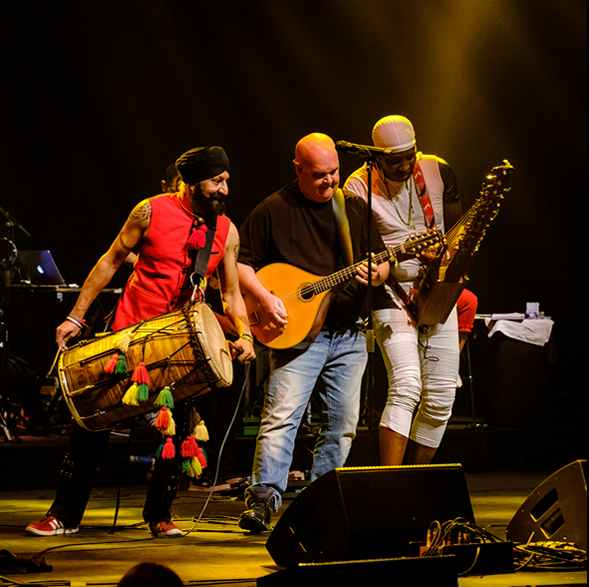 Simon Emmerson is once again joined by long-term members’ N’faly Kouyaté (vocalist, kora and balafon) and Dhol Foundation founder Johnny Kalsi (drums). The album also features special appearances from the Amani Choir, Stone Flowers and many more! Their acclaimed live performances are energetic and captivating and innovatively combine folk traditions of different cultures to breath-taking effect. They won Best Group in the 2017 Songlines Music Awards. Simon Emmerson is joined by long-term members’ vocalist, kora and balafon player N’Faly Kouyaté and Dhol drummer Johnny Kalsi. Their live show features contributions from a host of other outstanding musicians including Armagh-born vocalist and flautist Rioghnach Connolly and bodhrán player and percussionist Robbie Harris. They will also be joined by special guests Peter Tickell on fiddle, Ged Lynch on drums, Simon Richmond on keyboards and Lottie Cullen on pipes and whistle. The band are currently in the studio writing and recording a much-anticipated follow-up to 2016’s ‘The Source’ which fRoots described as “a colossus of an album”. ‘Do you need cheering up? Have recent world events events been getting you down??? Well what can we say?! It’s been an amazing start to 2017 for us so far, we got such and warm and appreciative response to our opening slot at the BBC Radio 2 Folk Awards last month, playing in front of that capacity crowd in the Royal Albert Hall must be one of the highlights of our career and now it’s just been announced we have won the Songlines Best group Award! This was a public vote so we really DO owe this one to all our friends and fans who made it happen. We really couldn’t have done this without you all! We will be accepting the award at Womad where we will be headlining the Charly Gillet stage on the Saturday night so if we don’t see you there make sure to come to one of our November tour shows and say Hello afterwards. We will have as our special guests The Dhol Foundation so it’ll be a night full of energy! Once again thank you all for voting for us in the Songlines awards and see you all soon. Following on from our hugely successful tour at the end of 2016, we are delighted to announce 15 dates in November 2017, including a return to the Barbican in London. 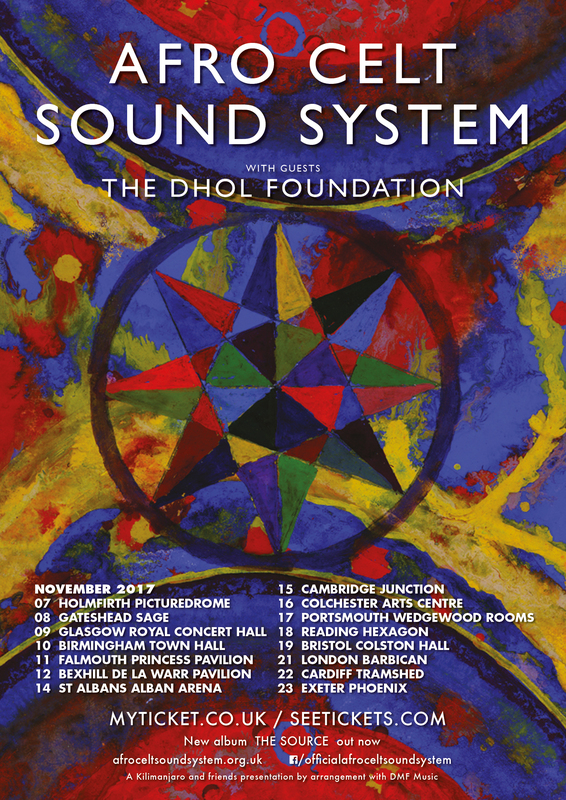 We will be joined on the tour by label mates and our friends The Dhol Foundation who will themselves release a brand new studio album ‘Basant’ later in the year. TDF deliver a now legendary wall of sound, global rhythms and thumping contemporary beats with the effervescent Johnny Kalsi, the UK’s most celebrated player of the Punjabi dhol drum, at the heart of their live show. Simon Emmerson, James McNally and Martin Russell are pleased to announce that they have been able to set aside their differences and come to an amicable agreement to bring their dispute to an end. Going forward, James, Martin and Simon have agreed that Simon will continue to perform as Afro Celt Sound System and James and Martin will work under a new name to be announced in due course. 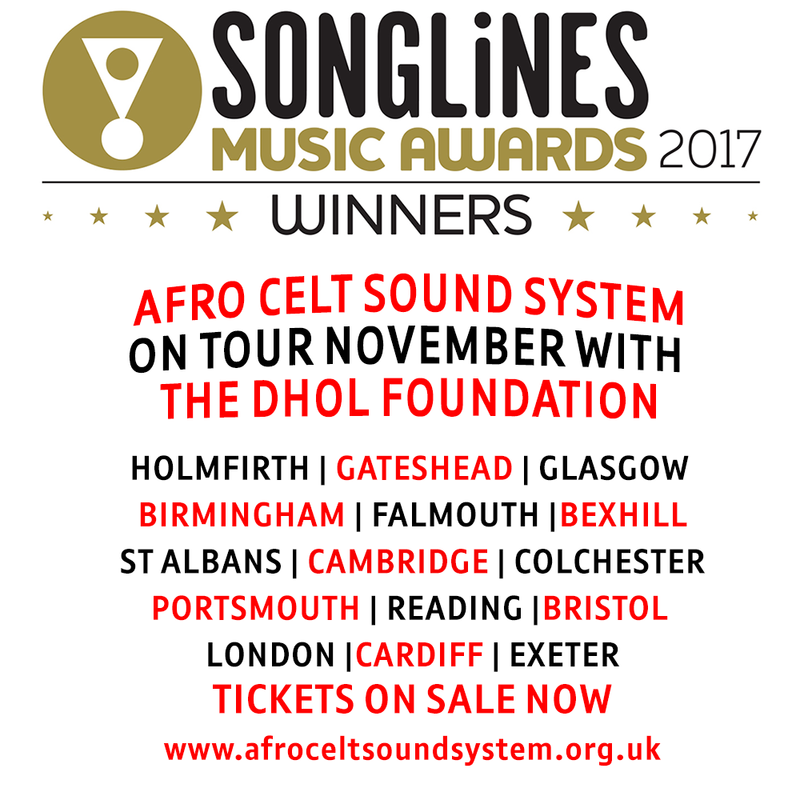 While James, Martin and Simon will no longer be performing or working together they recognise, and are grateful for each other’s contribution to Afro Celt Sound System over the past two decades and will be working with the extensive community of musicians that make up the long standing Afro Celt Sound System family. James, Martin and Simon would like to thank their colleagues, families and fans for bearing with them during this testing time, and all wish each other the best in their future endeavours.